Greenwich Village’s iconic green space, Washington Square Park has served as an energized outdoor living room for generations of this bohemian-rooted and student-infused community. A vibrant gathering spot for book-reading New York University students, playground-bound kids, dog run-destined canines, spontaneous musicians, serious chess players, murmuring pot dealers, and R&R-seeking residents and tourists alike, there’s no denying Washington Square Park’s magnetic appeal. Indeed, the park, with its signature stately arch and playful central fountain, has served as a point of countercultural congregation for more than two centuries, with a fascinating cultural and political history that’s helped keep it atop the list of New York City’s most beloved and best-known public spaces. Renowned for celebrating diversity and embracing nonconformity, come add your own unique vibe to the mix and stake out your spot for some of the absolute best people-watching in the city. The 9.75-acre Washington Square Park is set at the base of Fifth Avenue, at the center of New York University’s campus, and comes bordered by Washington Square North (Waverly Place), Washington Square South (West 4th Street), Washington Square West (MacDougal Street), and Washington Square East (University Place). Named after first U.S. president George Washington, the landmark Washington Square Park boasts more than two centuries of colorful history, much of it infused with a spirit of rebellion. Originally marshland frequented by Native American tribes, and then serving as farmland granted to freed African-American slaves, one of the spookier chapters in the site’s history dates back to its late 18th-century usage as a staging ground for public executions, as well as as a potter’s field — a public burial ground for the city’s poor, unknown, and epidemic struck (including victims of yellow fever); some 20,000 bodies are said to be buried under Washington Square Park still today. By 1826, the land functioned as a military parade ground, before being officially designated as public park space in 1827. At the time, it proposed a northerly escape from the congestion of the original city settlement in downtown Manhattan, then ringed by elegant residential housing and a fledgling New York University. The years that followed saw Washington Square Park serve as a backdrop to the annals of history: In 1838, Samuel F.B. Morse put on the first public demo of the telegraph; labor unions marched here following the disastrous Triangle Shirtwaist Factory fire of 1911 that claimed 146 lives; and the Beat generation, "folkies," and hippies of the 1940s through 1960s — many of whom resided in the bohemian surrounding neighborhood of Greenwich Village — made the park a focal point for gatherings, performances, and protests. From folksinger songs and guitar strums from the likes of Joan Baez and Bob Dylan to Allen Ginsberg poetry recitals, many luminaries have used the park as a stage. An ongoing spot for activism and political rallies, Barack Obama held a massive rally here while securing his Democratic presidential candidate nomination back in 2007. The park’s predominant features are its triumphant, marbled archway and fountain centerpiece. Presiding over the northerly side of the park — at the foot of 5th Avenue — the Washington Square Arch dates to 1889, erected as a centennial commemoration of George Washington’s presidential inauguration (a wooden iteration of the arch predated the current version: what you see today was actually finished in 1892). Fashioned in the style of Roman triumphal arches, inspired by Paris’s Arc de Triomphe, and designed by architect Stanford White, the white archway reaches more than 70 feet high and comes adorned with statuary depicting Washington, wreaths of laurel, and huge eagles. The arch presides over the 50-foot-wide circular fountain, the focal point of the park and a popular congregation area. The sunken, stepped fountain invites waders and wee splashers (in season), and comes ringed by shade trees — its surrounding circular plaza frequently doubles as an ad hoc performance space. Other formal park monuments include a bust of steel engineer Alexander Lyman Holley (1889); statue of Italian patriot, soldier, and unifier Giuseppe Garibaldi (1888); and a World War I memorial flagstaff (1920). Also worth a peek is the so-called Hangman’s Elm, an English elm set at the northwest corner of the park that’s said to be the oldest tree in Manhattan at over 300 years old (it comes riddled with dark legends of serving as a one-time gallows tree). Other linger-worthy park spaces include children play areas (one with a splash zone), two dog runs (one designated for big dogs and the other for small ones), a performance stage, petanque courts, and a chess plaza – all weaved together with landscaped lawns, gardens, trees, walking paths, vintage-style lights, and benches. Washington Square Park also offers public Wi-Fi and bathrooms. 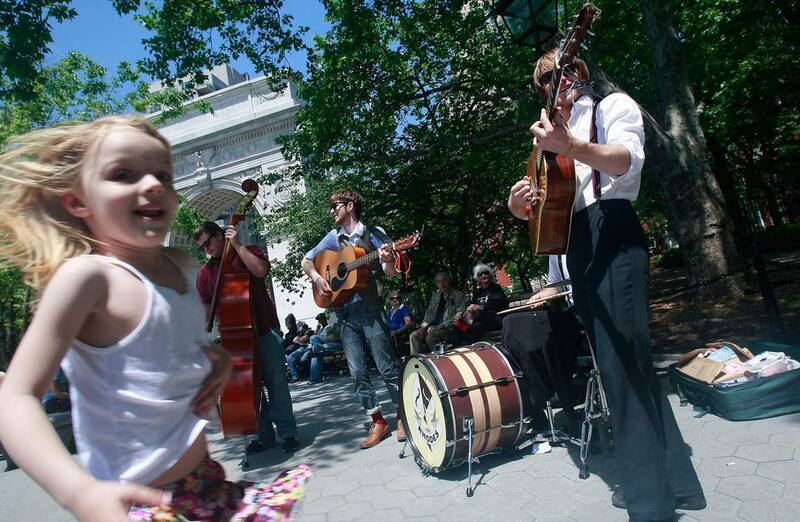 You’ll find buskers and performers of all stripes turning Washington Square Park into an impromptu performance space on any given day, a tradition within the park for generations of artists, musicians, and poets. The NYC Department of Parks & Recreation and Washington Square Park Conservancy run occasional scheduled programming within the park, too, including free tours, volunteer opportunities, and special events like movie screenings and live music. (Check out the events' calendars from the NYC Department of Parks & Recreation or Washington Square Park Conservancy for more.) Some fun annual events well worth marking your calendar for are the biannual Washington Square Outdoor Art Exhibit (held every Memorial Day and Labor Day weekend); the Children’s Halloween Parade and Dog Halloween Costume Party; and even a massive all-ages pillow fight that's held each spring. The NYC Department of Parks & Recreation lists two official street cart park vendors operating within the park, including the NY Dosas specialty cart, serving up well-reviewed Indian vegan fare (near the south side of Washington Square at Sullivan Street), and the Otto Enoteca Pizzeria Gelato Cart, an outpost of Mario Batali and Joe Bastianich's Otto Enoteca Pizzeria, which serves artisanal gelato and sorbetti (at the northwest entrance of the park). The blocks surrounding the park are filled with affordable grab-and-go grub, well-suited for a picnic in the park — try Mamoun’s for falafel (119 MacDougal St.), Joe's Pizza for slices to go (7 Carmine St.); or Red Bamboo for vegetarian Thai (140 W. 4th St.).